You may remember reading this post. Here is a little tutorial to explain how it came about. Firstly, gather together a clean page in your work book, a pencil, and a permanent pen (I use a calligraphy pen as it will give me both a thick and a thin line). Sit yourself down at a table, or stand at your workbench. I tend to do the latter, but it’s up to you. Take the pencil in your hand. Close your eyes, and with the other hand feel the page in front of you. 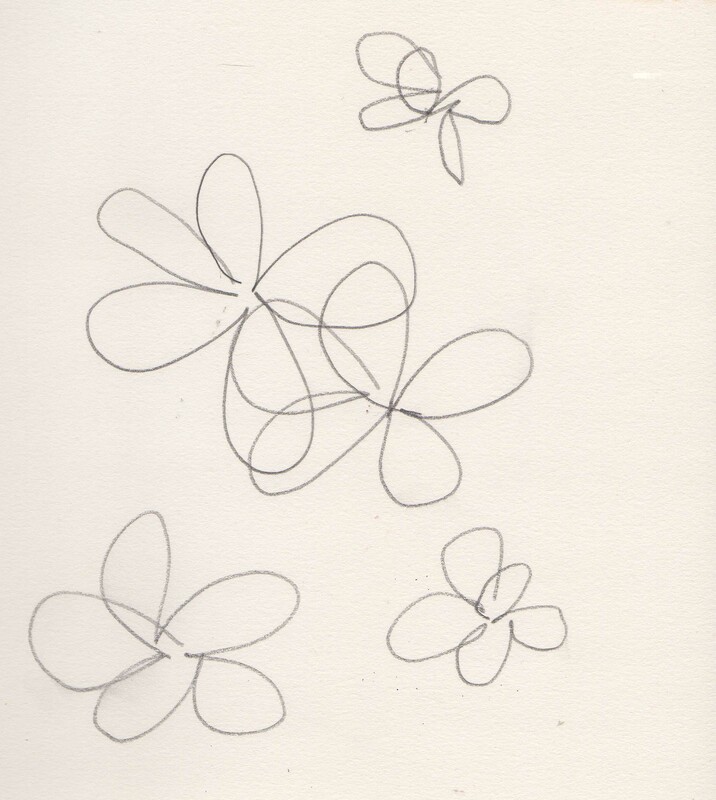 Now (and this is important) put that hand down at your side, and without really thinking about it – and keeping your eyes closed – draw a few quick flower shapes with the pencil. Three is a good number, or five, an odd number seems to work well. Done it? Open your eyes. Does it look a mess? Here’s my version. 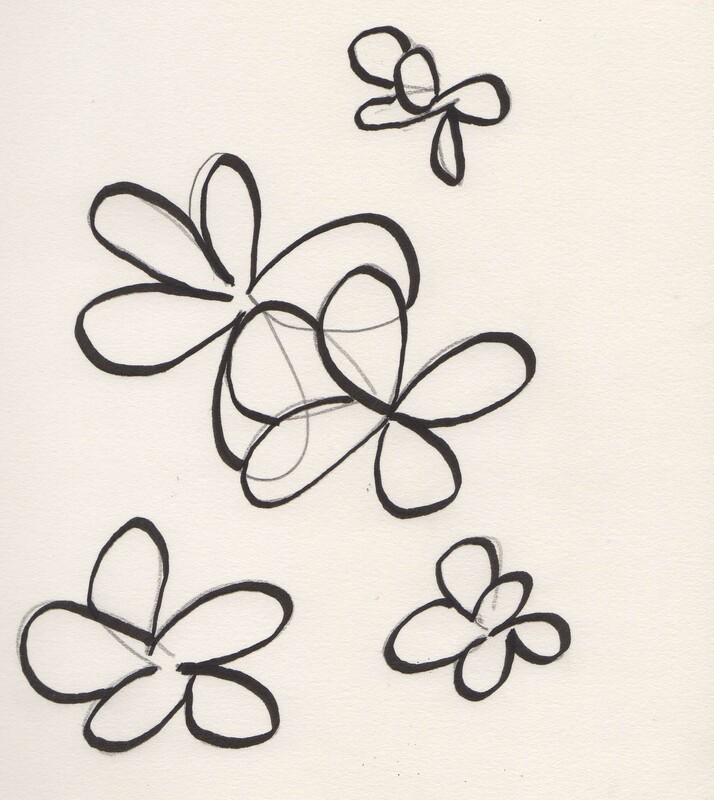 In theory, each flower has five petals, and I have to say that I’ve used heavier pencil strokes than normal so that the page will scan. 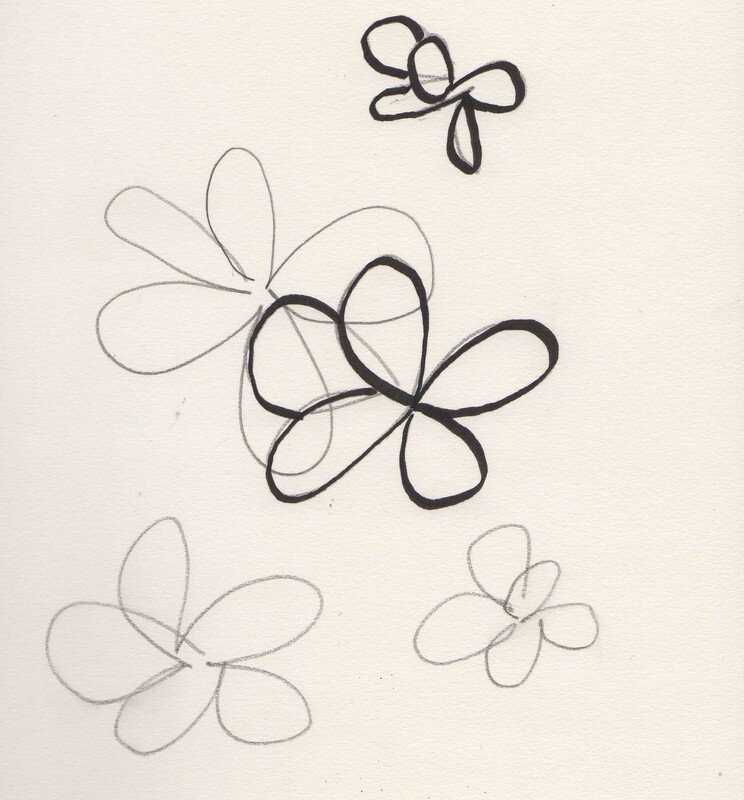 Some of the shapes look roughly like flowers -some look odd -and some look a real mess! This is where the don’t panic comes into operation! You can keep your eyes open for most of the next stages, and you can use both hands. Making sure that the other hand is by your side is a good way of not cheating. Feeling the page with it in the first place just seems to reinforce the size of the page. Can you see, in the middle, I have decided which one is going to be prominent. It could have been either – you choose on your page. Don’t worry about the odd lines that you have ignored – they are fine and will not be obvious at the end. We’ll add some colour now. 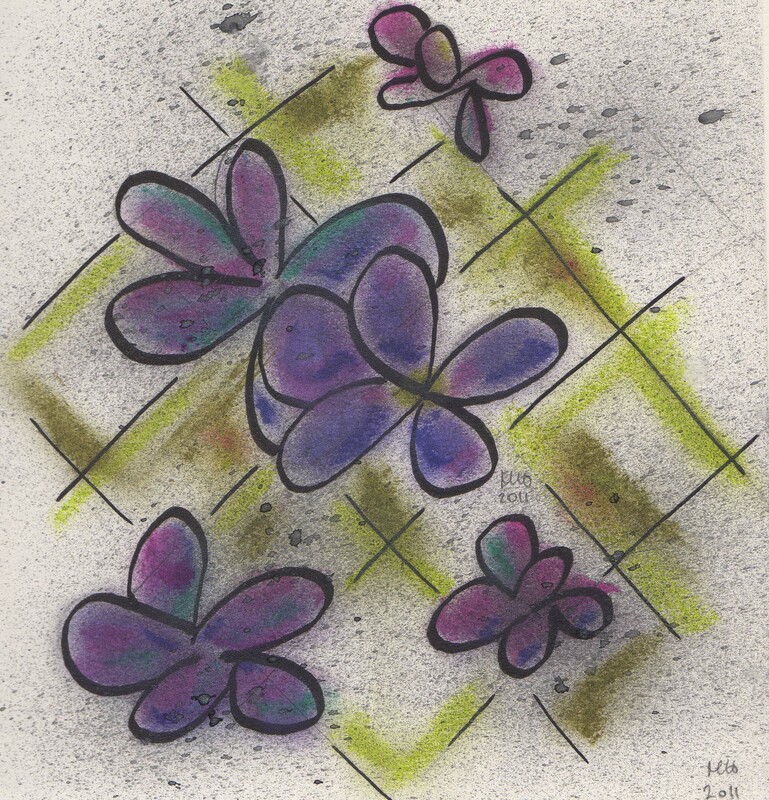 You can use any medium you like, but I’ve used Shiva/Markal Paintstiks. These are oil based, but become glowing colours once ‘cured’ and can be used on both paper and fabric, making this technique an interesting one to use for textiles, too. Choose a limited colour range. I’ve used 3 for these first steps. Here is the start of the colouring. You can see that I’m not being very deliberate or careful. If it goes over the edge – don’t panic. Just leave it. 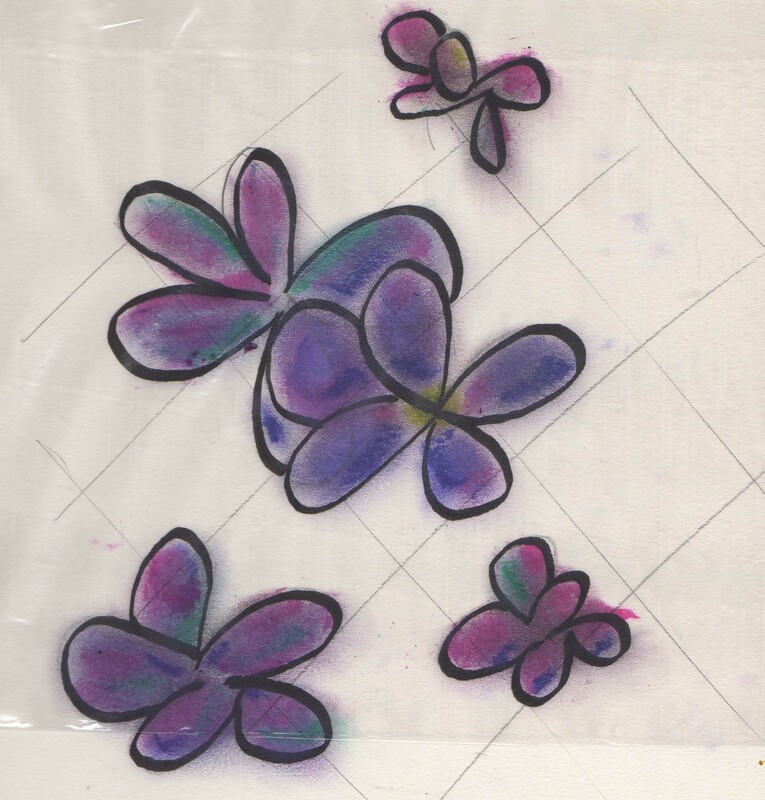 Do this with all the flowers, then, using your finger, blend the colours together to fill in the petals. 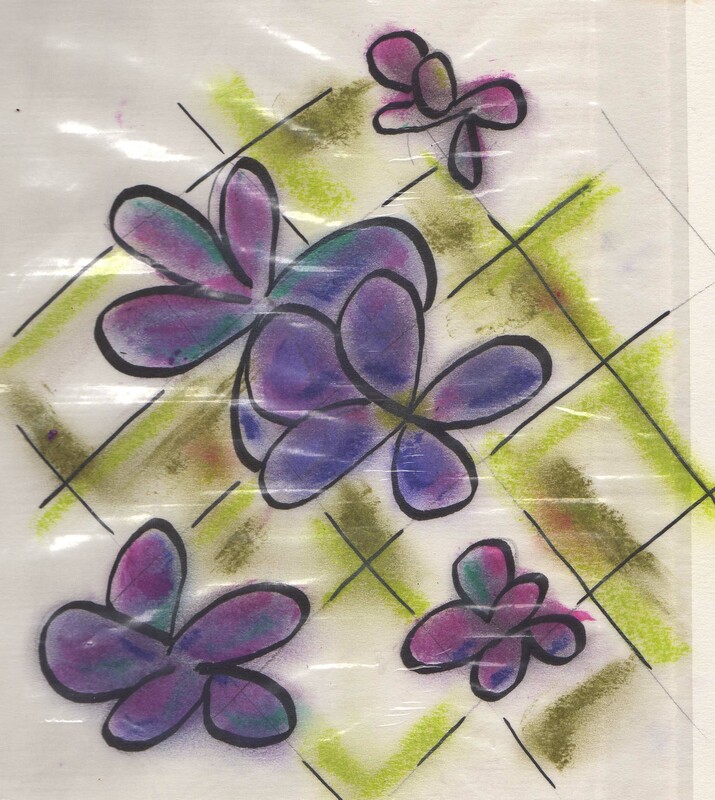 I apologies for the strange ‘overlay’, it’s a clear bag that I’m using to protect my scanner as the Paintstiks haven’t had time to cure. You will see it in the next few photographs, but not at the end. Now, once again pick up your pencil. I would normally incorporate this step in with first one, but doing your first one this way makes it less confusing. Go through the process of closing your eyes, feeling the page and removing your hand to your side in the same way that was mentioned above, then draw a few quick straight lines across the page in two directions. The next step is to add colour to the background, and these lines will help us to do that. So, take your trusty pen and roughly ink them in. This next picture will show you that I haven’t covered every line, or, in fact, all of a line. I’ve used the same pen, but only the ‘thin’ dimension. After I did that I added the hint of foliage along the ‘trellis’ lines and scrubbed those with my fingers too. Apologies for the now wrinkled clear protection! That’s the last you’ll see of it, I think. It’s almost finished, but the background still looks a bit sparse. The genius of the next step is that it brings the whole thing together so that it looks more co-ordinated. 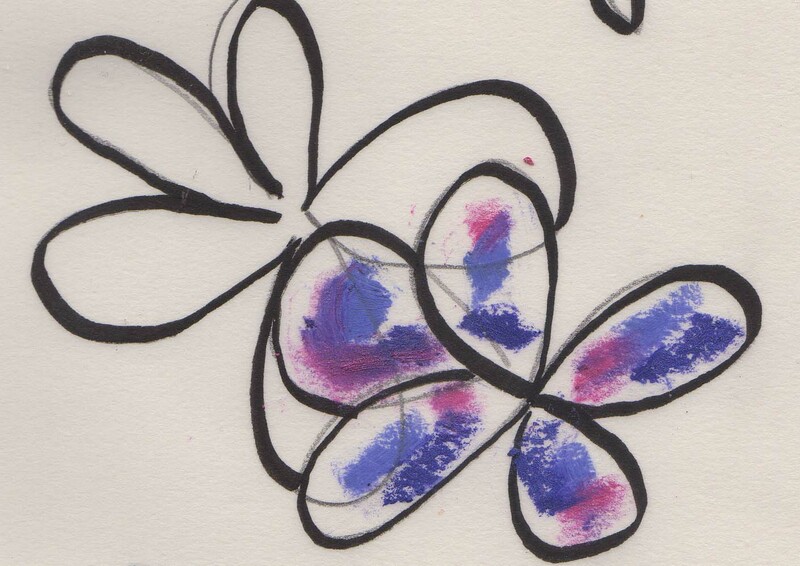 You now need a spritzer bottle, some black ink, water, and scrap paper. Half fill the bottle with a 50/50 mix of ink and water. 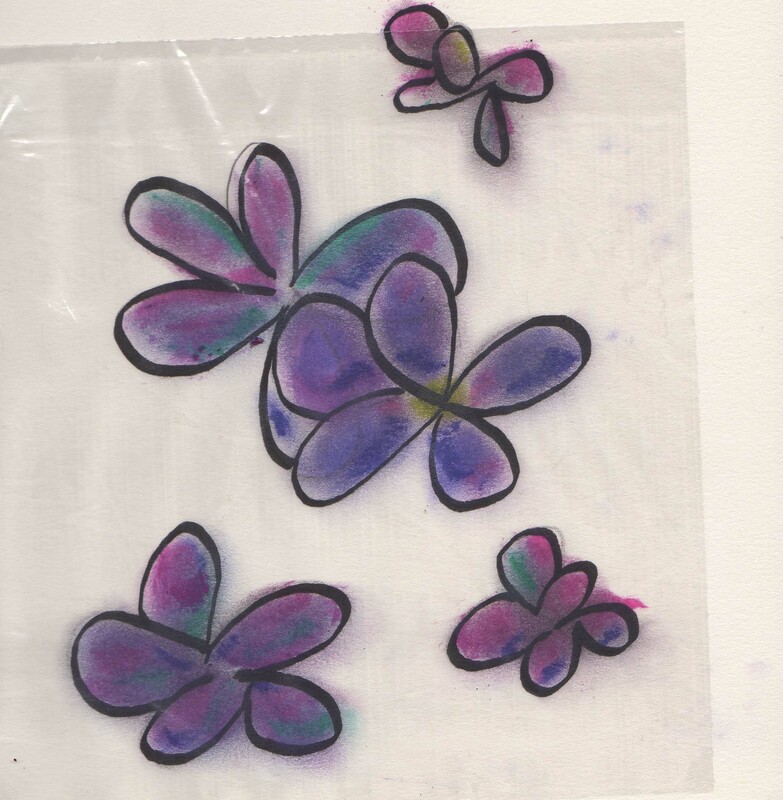 Give a few squirts onto your scrap paper (protect your surface – see below) and adjust the ink or water until you have the colour you want. When you are happy continue with your picture. Make sure that your page is placed on a well protected surface. You are going to squirt the ink mix over it, so make sure it doesn’t go anywhere you don’t want it! Ink on the dining room carpet won’t look good! Gently squirt the spritzer bottle, a couple of quick sweeps is probably all you will need. Sign and date your work, of course, and Voila! Doesn’t that look more integrated? No ink? No spritzer? Splash paint with a wet brush – or dab all over with a used tea or coffee bag. There’s nothing quite like that spritz, though. Please remember that the copyright of both the words and photographs in this tutorial remain with me, you are free to print it out for your own use. If you try it, let me know, I’d love to see if you blog about it, or create a piece of work using the technique. Once you have tried it – have another go. It gets better and more fun with practice. Don’t forget that you can find prompts and more on the Be Creatively blog. I shall be giving this a go in my Easter Holiday, not that far away now thank goodness! Waiting for it to dry, will try again as composition isn’t too hot. This sounds like lots of fun & I will surely be giving it ago. So fun – love your tutorial. Great project. Is this for Seth’s Buried Treasure – I must have missed the reference… hope I’m on the right page – if not… sorry! If so – thanks bunches for sharing!! j. Yes, it is, and I’ve just realised I forgot the link back. Thanks for the reminder. What a fun tutorial. I have some of those paint stix, so I may just give this a go. Thanks for sharing this repost, because I really enjoyed it. Would love to see the result. Thanks for dropping in.